The wide-awake approach to flexor tendon repair has decreased our rupture and tenolysis rates, and permitted us to get consistently good results in cooperative patients. We no longer perform flexor tendon repair with the tourniquet, sedation and muscle paralysis of general or block (Bier or axillary) anesthesia. Injection of only lidocaine with epinephrine wherever incisions will be made in the finger and hand permits comfortable tourniquet-free awake patients cooperate with active finger full flexion and extension testing during the surgery. We no longer use Kleinert rubber bands or “place and hold” with protected post-operative active movement. True active movement, just enough to keep the tendon gliding a little, is giving us better results. In the first 2-4 days after surgery, we keep the hand elevated and immobile in a splint with the wrist in comfortable 25-45º of extension (not flexed or neutral). 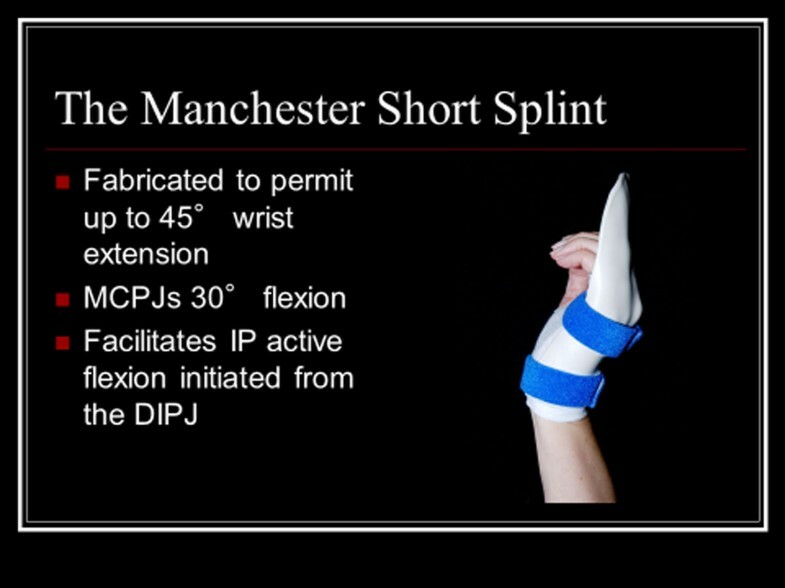 The MP joint is flexed to a comfortable 45ºto 80º from full extension, and the PIP and DIP joints are fully extended. Collagen formation does not start until day 3, so serious adhesions will not start before then. We avoid immediate movement after surgery as this generates bleeding inside the wound which adds to the scar tissue. Also, the finger and tendons are swollen and have more friction as they try to move in the sheath in the first 3 days. Elevation and immobilization decrease bleeding and swelling in the first days after surgery. We almost never need to do tenolysis after flexor tendon repair now. The reason is that we make sure we have a full range of active flexion and extension before the skin is closed so that tenolysis is less likely to be needed postoperatively. If the repair does not fit through the pulleys during the surgery, it is not likely to fit through the pulleys later and will almost certainly require a tenolysis. After the repair, the awake comfortable patient with no tourniquet is asked to flex and extend the finger completely. If the repair gets caught on pulleys, we incrementally vent (divide) only as much pulley as we need to in order to see full active flexion and extension. We agree with Jin Bo Tang that the entire A4 pulley and up to half of the distal A2 pulley can be divided without causing bowstringing if most of the cruciate pulleys are preserved. What you see with active movement during surgery is what you get. It changes the whole operation. An alternative to venting pulleys is to trim the repair or slim it with more sutures so it can fit through the pulleys before you close the skin. An educated patient is much more likely to do what he should right after surgery than one who wakes up with a freshly repaired flexor tendon and has no idea what he should or should not be doing. In addition, the awake patient has seen his finger move well during the surgery and knows it will work if he follows the instructions given to him during the surgery. Seeing is believing. I talk to my patients during the surgery and explain to them how to look after their hand after surgery. We also have our therapists come into the clinic room where we do our surgery to intraoperatively assess the patients, see the repaired structures moving, and educate the patient before and during skin closure. The patient gets to meet and know the therapist during the surgery. We first repair profundus and be sure we see full active movement with no gapping. If the repair of superficialis seems like it will be possible or helpful, we go ahead and do it and retest full active fist flexion and extension. If the movement is downgraded by repairing superficialis, we will take down that repair. There is currently debate about to repair or not repair superficialis. Seeing the movement during the surgery takes away all debate because seeing movement is understanding results.